First screened in 1951, Alice in Wonderland brought a young girl named Alice into the nonsensical, magical world of Wonderland. The dedicated footwear pack captures key scenes and personalities from the film with three prints including the Rabbit Hole, Wonderland and Cheshire Cat patterns. The Rabbit Hole print takes inspiration from Alice’s escape from Wonderland, highlighting the White Rabbit, Tweedledee and Tweedledum, the Mad Hatter, Dormouse, Queen of Hearts and her Playing Cards henchmen on the side panels of the Vans Sk8-Hi Reissue in adult sizing. 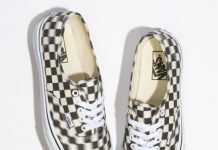 Several of these characters make an additional appearance on the Wonderland print that recreates various, colorful moments from the movie across the Vans Classic Slip-On in women’s, kid’s and toddler’s size runs. The mischievous feline himself, Cheshire Cat, finishes off the footwear portion of the Alice in Wonderland series with a psychedelic, allover arrangement on the Vans Authentic available for adults, kids and toddlers and a face print on the Vans Classic Slip-On made exclusively for kids and toddlers. The apparel selection inspired by Alice in Wonderland includes men’s and women’s items such as tees, pullovers and accessories. As an added bonus, key men’s apparel pieces featuring Cheshire Cat are printed with special glow-in-the-dark ink. Debuting in 1961, 101 Dalmatians hit theaters over 50 years ago and charmed audiences across the nation with its cast of canine heroes. Disney’s Dalmatians come together for special colorways of the Vans Sk8-Hi Reissue in white and Authentic in red. Within the pattern furry friends can be seen in playful poses and upon closer inspection, one can spot a dalmatian chewing on his favorite shoe, the Vans Classic Slip-On. Both styles will be available in adult size runs while the Authentic will be taken down to kids and toddler sizing. Apparel inspired by 101 Dalmatians includes a raglan, crewneck fleece, keychain, backpacks and socks designed for women. The Jungle Book became an animated film in 1967 and has taught generations about the “Bare Necessities” of life since its inception. The tale centers on the adventures of a young boy named Mowgli as he journeys through the jungle with his bear buddy, Baloo, and panther pal, Bagheera, and encounters villains Shere Khan, the man-eating tiger, and Kaa, the hungry python, in addition to the memorable orangutan King Louie. 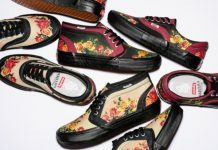 All five characters are blended into a vintage Vans pattern to create a floral camouflage-style print for the Vans Classic Slip-On in adult sizing and Vans Authentic in adult, kids and toddler fits. The Jungle Book apparel includes a raglan, bucket hat, backpack and socks designed for men. To celebrate the launch of the latest Disney products from Vans, Vans Surf’s Leila Hurst and Vans Skate Team riders Daniel Lutheran and Lizzie Armanto showcase various pieces in two Disney-inspired trailers. Watch the canine-loaded Leila Hurst clip and psychedelic Dan Lu and Lizzie video on the official Vans YouTube channel. The Young at Heart Collection releases on Friday, October 9, in the US and arrives at international retailers throughout the month. Join the Disney and Vans conversation on social media platforms by using #DisneyandVans and learn more about the collection at vans.com/disneyholiday.